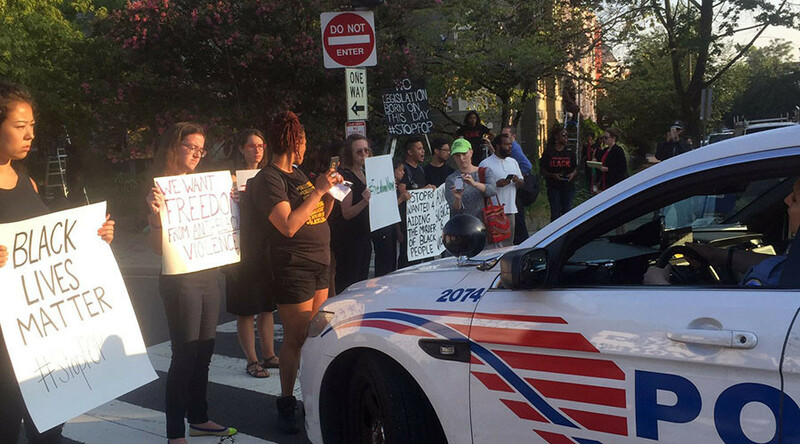 Black Lives Matter protesters taking aim at police union offices forced a shutdown of one in Washington, DC. Simultaneously in Detroit, activists chained themselves to a police station to demand the ouster of an officer who shot dead a 7-year-old in 2010. Protests, held by Black Youth Project 100 (BYP100) and Black Lives Matter, hit several cities across the US on Wednesday. July 20 would have been the 14th birthday of Aiyana Stanley-Jones, who was shot dead in a SWAT raid on her house in May 2010. It was Detroit officer Joseph Weekley who killed seven-year-old Aiyana as she slept next to her grandmother. After a five-year process and two mistrials, Weekley returned to work in April 2015, cleared of all charges. More than six years since the fatal raid, BYP100 and Black Lives Matter staged protests not only in Detroit, but also in DC, New York, Chicago and Oakland, to demand he be fired from the Detroit Police Department. “[…] he now serves as a co-lead of the department’s Committee on Race and Equality – a move that many participating in the action say was disrespectful to Aiyana’s family and residents of the city of Detroit,” the BYP100 said in a statement on its website. Protesters in Detroit chained themselves to chained DPD's 3rd precinct. The same protest action was repeated in Chicago, where some arrests have been reported. In Washington, DC, protesters blocked the legislative office of the Fraternal Order of Police (FOP) and nearby streets, forcing it to cancel its operation for the day. FOP executive director Jim Pasco said the police union “work will continue from other locations,” on Wednesday. After 12 hours of the FOP occupation, protesters showed no signs of letting up. In New York City, members of the BYP 100 and Million Hoodies staged a sit-in at the Patrolmen’s Benevolent Association’s (PBA) headquarters. “We are here today, to demand three things: disband the PBA, fire Officer (Wayne) Isaacs, defund the police, and fund black futures,” a demonstrator chanted. They say money being spent on police should be invested in developing affordable housing, education and mental health resources in black communities. Calls to defund the police were also heard in Oakland, where protesters chained themselves to the doors of the Oakland Police Officers' Association offices.